What are the misspellings for roman? What are the common mistypes for roman? What is the definition of roman? 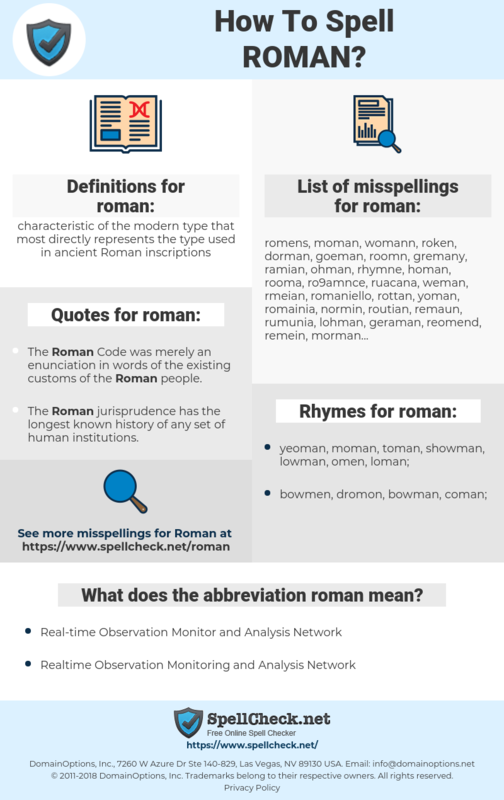 What does the abbreviation roman mean? What are the quotes for roman? What are the rhymes for roman? What are the translations for roman? 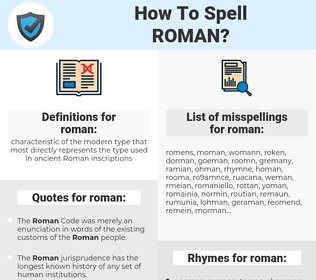 What are the common typos for roman? Roman as a boy's name is pronounced roh-MAHN, ROH-mun. It is of Latin origin, and the meaning of Roman is "citizen of Rome". Variant of Romanus; the name of several obscure saints and a pope. Rome was the center of the Roman Catholic faith. In the ancient world, Roman citizenship represented an ideal standard of rectitude and courage. Even as the Imperial declined, the ideals of Roman citizenship remained to rebuke those responsible and to inspire those who opposed them. Romain is a French form. Film director Roman Polanski; author Romain Gary. This graph shows how "roman" have occurred between 1800 and 2008 in a corpus of English books.